From September 2014 Computing will be a subject in its own right in English schools. Of course at Raspberry Pi Towers we are delighted (and I mean dancing around like a drunk uncle at a wedding reception delighted) that young people will now have the opportunity to study one of the most creative, exciting and challenging subjects in the curriculum. But who will teach them? Computing is effectively a brand new subject and there are relatively few specialist teachers to deliver it. The problem is worse for primary school teachers who have to teach a range of different subjects and who typically have fewer IT resources than secondary schools. So, of course, we need to train teachers, especially primary teachers. And training works wonders—teachers arrive at my courses full of trepidation and weird rumours (you need to be a maths genius; it’s all about programming; coding gives you hairy palms). They walk out of the end of the day confident and buzzing with excitement and ideas. That’s all it takes. Of course no one will be an expert after one day, but the point is that you don’t have to be. Computing at this level is about problem solving and puzzles and creative fun—things that human beings are naturally drawn to and enjoy. And it’s definitely not just about “coding”. Whatever that is. So hurrah for training! Let’s all sign up for a course at our local school! Except … there isn’t any to speak of. What there is is typically dispersed and expensive and of variable content. What teachers and schools need is widely available, low-cost, high quality, curriculum-centred training. Which is what Code Club thought too. So in true Code Club fashion they decided to just do it. We love Code Club! Anyway, I’ll let them fill the rest in. I only meant to write a sentence as an intro but as you can tell it’s something I’m passionate about. Plus, I like showboating. And if you are a school or teacher and would like to get involved, pop over to Code Club Pro’s site for more information. Code Club, the network of over 1,875 volunteer-led after-school coding clubs, with the support of Google and CAS (Computing at Schools), is launching a nationwide training programme to teach core computing skills to primary school teachers. The CPD program has been launched in response to widespread teacher demand for training in this area. According to Code Club, which has access to a wide network of schools, the training needs of teachers has so far been overlooked in this process. Its founders said: “Teachers are the key front-line implementers of the curriculum and more needs to be done to support this transition”. 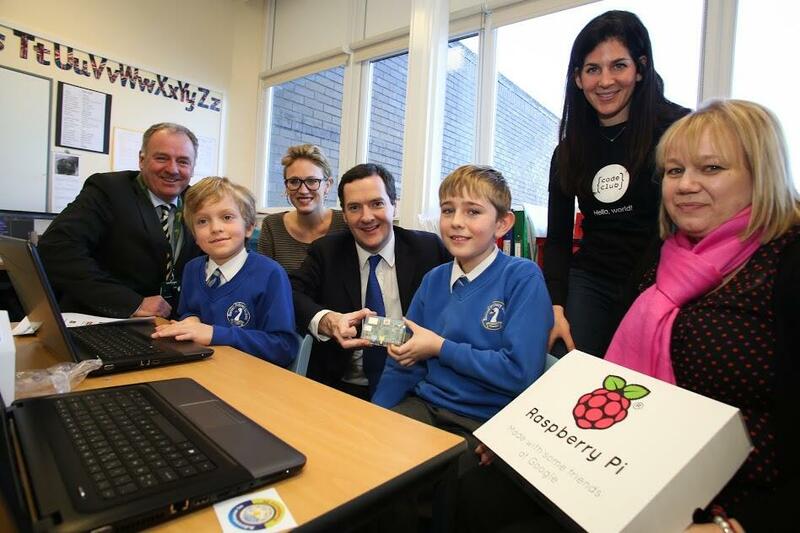 Code Club Pro was launched today by the Chancellor of the Exchequer, George Osborne, at a special Code Club session in Bexton School in Knutsford, Cheshire. Launching in April, Code Club Pro will enable primary school teachers to quickly understand the requirements of the new computing curriculum. The mission is to deliver training in computing to over 20,000 primary school teachers by 2016, while reaching many more through the provision of online programmes and resources. Is that an Adventures in Raspberry Pi sticker I see? Excellent! I’m pleased to say my school had a course in Computer Programming waayyy back in 1971 (and after three weeks it was me teaching the class as the person tasked with the job couldn’t keep up with her class). Really pleased to see learning computing is coming back *properly*, with programming not just clicking icons. In my Finnish class, we were taught basic ATK (computer studies). Didn’t go much further than how to print a 1-line document (XP/MS Office). Beyond that, the teacher was stumped – altho’ he really tried his best. I finally gave all the students a copy of Ubuntu Fiesty Fawn (Pre-Pi days) and they were as happy as a pig in muck! School never figured that most were war-refugees from places like Somalia, where to own a computer was unheard of, let alone spend a couple of years’ money on a licence to use a word processor. I’ll be going back to (another) Finnish school next month, to learn esoteric subjects like project management (yawn…) and Scrum. I’ll be using my Pi as my project (PiLab – see website under construction). I am trying to find a school in London with Raspberry Pi activity – would like to visit during BETT next year – can you recommend any? Would you know where the student performance objectives for the curriculum in the schools can be found? In the interview notes from prospective employers 12 years hence. Oddly enough for a cynical engineer such as myself, I find that I am in complete agreement with Carrie Anne’s opinion on the matter. Is there anywhere interested parents can download a free copy of the curriculum? 1 & 2 seem quite well thought out – concise on desired outcome whilst allowing flexibility of implementation. I could not agree one iota more with the sentiments expressed. From a syntactic perspective, “Computing” is precisely the correct term we should be using, and we should tone down the “Code” and “Coding” words as much as possible, at least at the entry levels (and students in every grade will almost all be at entry level come next Fall). The “C” words are fine for the proto-nerds (and I use that term as one of endearment, since I “were” one many moons ago), as they’re already well on their way to inventing the next Facebook, Instagram, Snapchat, Minecraft, Candy Crush, etc. We risk alienating the vast majority of people who aren’t just not familiar with coding, but outright fear it and not just because they think they have to be math(s) whizzes to be able to compute (let alone code). This fear is actually more acute in teachers in the trenches than their students, as evidenced by the “so simple a five year-old can do it” mantra, that you’re literally best off finding any five year-old to solve your problem. The fear is even more strident in older teachers and those who converted to administration long ago who get to really call the shots, aka spending extremely rare discretionary money already earmarked for making The Usual Suspect IT companies and their over-fed executives yet-more wealthy. Said Suspects are wasting no time attempting to blunt the conversion of ICT into Computing, and nothing would work in their favor more than fanning the flames of fearful teachers who are wondering how in the world they’re going to become “coders” on top of everything else they’re supposed to cram into their already 36-hour long days (including weekends, when it comes to training). We’re already a year behind where we really needed to be in order to introduce Computing into classrooms at the student level, given that it’s a mere four months until the Summer break (for those who actually get one) and some districts only allow as little as eight weeks from the end of one school year until when teachers need to be back on-site for new school year preps, and the new school year starts as early as the second week of August around here in Northern California. It’s quite ironic that I’m sitting barely 100 miles from the middle of Silicon Valley as I write this, yet I might as well be in Lower Slobovia in terms of the familiarity teachers have with technology of any kind, let alone something involving an interpreter or compiler. When I proseletyze computing for students, the eyebrows begin to arch, foreheads start to furrow, and tears are close behind as apprehension grips my educator audiences. This is the crop we have sown by allowing people to believe they can avoid learning about STEM at any level of detail beyond the meaning of the acronym and still dare to call themselves educators. They’re so out-of-touch that they wouldn’t even know where to begin fabricating a buggy whip, much less developing an app, controlling a robot, or gadzooks, flying a camera-equipped quadcopter! Thanks for helping to dispel the fear and expose the wonder and awe of discovering how much fun and excitement can be had exploring STEM subjects from all perspectives, including the historical, psychological, emotional, visceral, and everything else not normally associated with such material. We’re very much looking forward to sharing what you’re all doing with the rest of the world. It also conflates programming with Computing when it is only a part of this rich, far-reaching, creative, powerful, useful, fun, challenging and beautiful subject. Warning: There are many constructive comments, but being Youtube there are also the usual bad mouthed trolls. I found the segment almost laughable. The UK Government have pledged £500,000 to train 170,000 teachers in the next six months (£2.94 each), and the person put in charge of the initiative admitted she could not ‘code’, but said teachers would be able to learn to teach coding in just a day! Jeremy Paxman did an unusually bad job of pursuing this. Duh!! I’ll have to refresh my ‘coding’ – I forgot to close off my hyperlink. However, it still works. Clive – I do understand that you folks understand the “code/coding” conundrum with the general public, and I should have couched my comment to be directed at the hard-core, well-meaning tech folks who may want to help, as well as the politicos and other headline-seeking types who wouldn’t know a variable from a variac and are just looking for something to glom onto that seems to be the thing of the hour. At least we now have some useful material to start the journey, knowing that it isn’t perfect on Day One, but no plan survives contact with the real world, whether on a battlefield or in a classroom. In addition to the computing content, this will also be an opportunity for both educators and students to learn the principles of kaizen (continuous improvement) that have been used in successful industrial/manufacturing organizations world-wide for the past few decades. Stay nimble, keep on your toes, adapt the material to fit what the kids find exciting and stimulating, and then share what works with everyone else via every channel available, e.g., social media, blogs, on-line discussion groups, video posts, etc. We educators nowadays need to be masters of differentiated instruction, able to pick up on clues the kids are providing as to how each of them learns best, and the material needs to be expanded by us to fill any gaps we find. Code Club Pro and similar efforts seem to be the right venue for sharing this sort of thing, and minimizing the number of places teachers need to go to obtain the latest-and-greatest quality material is vitally important to helping those climbing the learning curve in the classroom. Will any of the educator folks from the Foundation and the organizations discussed in the above post be attending Maker Faire San Francisco (San Mateo County Fairgrounds South of The City, in actuality) in May, which Eben and Liz have traditionally attended? I would love to get us birds of a feather together there to share ideas we’ve been working on in our respective corners. I want to move to UK ! I’m a teacher in a primary school but in France where we are far very far to introduce computing with children. I would like to do anyway in my classroom but I can’t find ressources …. If you have ideas … Good luck with jour projets ! If you came to the UK to teach Computing I wouldn’t be at all suprised if they had you teaching French within a week, never to get near a computing class ever again. I am currently a voluntary TA at a secondary school, helping to teach the GCSE Computing course. I I have been a professional Software Engineer for 25 years. Although I am rather cynical about this ‘coding’ initiative (what has George Osbourne got to do with it? ), I would like to get involved (may as well do as much to help as possible). I’m having difficulty finding out how to enrol. Are there any details/links? From their page: “If you’re a lovely programmer who would like to join our trainers, please email [email protected] for more info. ” Good luck with it! I hate to be a party-pooper, and I’m strongly in favour of the re-introduction of computing into the school curriculum, but since the idea was first mooted it has seemed to me that the elephant in the room is the shortage of suitable teachers. I have no experience of primary education but I know that teaching at secondary and tertiary levels requires specialists with a proper knowledge and understanding of their subjects. I am not aware that computer science graduates are queueing up to become teachers, and while self-taught enthusiasts may be as good or better there aren’t so many of those either. Schools, unlike FE colleges, are obliged to deliver whether they have suitable staff or not. Hence maths is often badly taught because there aren’t enough mathematicians to go round; it is also part of the reason that computing morphed into the appalling “IT”, that for so many students amounted to little more than office skills. Some schools will be lucky. Others will have to cope as best they can, which will mean sending volunteers or pressed men and women on short courses that will not prepare them adequately for what they will be expected to do. Those sent will often be the ones most most easily spared: rarely will they be the brightest and best, whose reassignment would create problems elsewhere. I would love to be wrong about all this – I identify absolutely with the Foundation’s mission to inspire the next generation of computer scientists and engineers – but unless there have been developments that have passed me by, I fear I may not be. We all know that there is a shortage of suitably skilled teachers — this is why Code Club Pro was set up! Remember that the new Programme of Study didn’t happen overnight, lots of people and organisations have been campaigning and banging on about this for several years. In fact this is the reason that there is a new PoS : it wasn’t some Schmidt-catalysed Govian epiphany, whatever the media would have you think ;) So I’m not sure what party you think that you are pooping — it’s a real problem. Compare the UK spend on this to Jersey’s IT education initiative: £6m, with £2.4M of that on teaching and learning (Jersey has a population about the size of Great Yarmouth). When you say “Schools … are obliged to deliver whether they have suitable staff or not … Some schools will be lucky. Others will have to cope as best they can”, you’ve just described exactly how KS1-KS4 education in the UK works! For any subject. But what’s the option? Don’t introduce the new PoS until all of the teachers are fully trained? Of course that would never happen. So let’s roll up our sleeves and get on with it. Join Code Club Pro, become a STEM ambassador, get involved in Computing at School hubs, contact your local school directly, persuade your employer to do CPD outreach. It’s a long term plan but we’ll get there. It is a worry that it could all go down the route of the old TVEI school nonsense. I went to a school that was selected for very early days of TVEI. It meant we had a physics teacher give us about 6 weeks of an electronics class and left twiddling our thumbs, when he ran out of course material. There was a class full of BBC micros, that the teachers hardly ever touched and another class full of typewriters, that never got used, because they couldn’t get a qualified secretarial studies teacher. The whole thing was a catastrophe. I never forgave the Tories for that. They mucked up my time at school. I’m glad something is getting done. I had a few months of BBC BASIC as a child and little else until I went to Uni the second time, and even then I had to learn from students, not lecturers most of the time. I envy the kids of today. I hope they pay attention, they really can make the world a better place if they try. Just saying, the forums are down. Don’t Panic. will there be any for example online training for those outside of UK? i know this is UK based project, but perhaps there are others outside UK that could also benefit as well as contribute. For a politician, that’s an extraordinarily unequivocal statement – none of their usual wriggle-room. So next time Messrs Cameron, Osborne or Gove are being interviewed on TV, they should be ambushed with a Raspberry Pi setup and asked to demonstrate how to knock out a quick game of Pong. I think it’s great that Code Club is involved in this. The materials they have provided for after-school clubs are excellent and have already given many young people their first taste of programming. This is something I’m very interested in as I have two children in primary school. Whilst adding programming for secondary schools is going to be difficult I see primary school as being the biggest challenge and until Code Club Pro was announced it didn’t seam to be getting as much immediate attention as it deserved. I don’t think Scratch is going to be difficult for teachers to learn, but there are some challenges. It’s one thing to follow a set of instruction and everything work, but when things don’t work first time (and it’s easy to make a mistake that breaks a program) then that is when it is important to understand why it should work and what may have gone wrong. I’ve already run a term of Code Club and I’ve already said that I’m interested in getting involved with Code Club Pro if I can fit it in. It’s great to finally hear that someone’s addressing the problem of giving teachers appropriate training for teaching Computing. I wonder though, how do we address (for example) a rural school in the middle of Nowhere-shire with 28 kids and teachers who’ve never heard of “Code Club”? Sounds to me like the next time Ofsted goes around to these schools they’ll be getting shut down for not being able to teach the curriculum properly. Which, of course, will be just fine by the government, because they won’t have to pay to keep them open. When you say “UK” schools do you just mean “schools in England”? Pleas let me know where my nearest code club is hidden.I have 20 years experience in digital,microelectronics,brushing up in code would be great,and perhaps a help to others.